The UMaine System is facing a $36 million deficit. Reaction to the proposed cutbacks in USM faculty, staff and programs is immediate and highly critical. 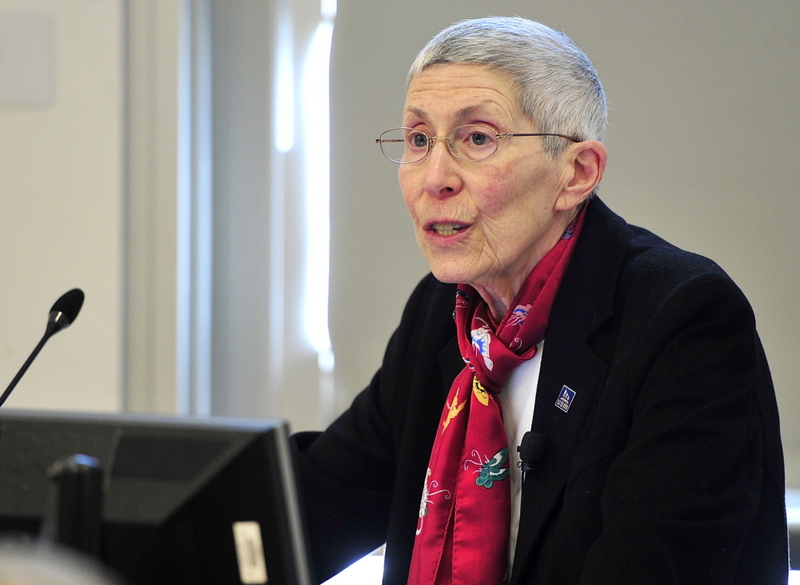 The University of Southern Maine should cut four majors and lay off as many as 50 faculty and staff to help close a $14 million budget gap in 2014-15, USM President Theodora Kalikow said Friday. The reductions – along with an announcement later this month about closing some facilities – would still amount to only about $7 million in cuts to the school’s annual budget of $140 million, Kalikow said. The University of Southern Maine is trying to cut $14 million, or 10 percent, from its $140 million annual budget. Proposed cuts include staffing and programming changes. FACULTY: Cutting faculty by 20-30 people, which includes eight faculty members in the four shuttered programs. STAFF: Cutting staff by 10-20 people. The cuts are in addition to 14 staff members laid off earlier this year. RATIO: Moving from the current 1-to-15 faculty-student ratio to a 1-to-23 ratio, which is the average at peer institutions. USM President Theodora Kalikow announces the budget cuts Friday. The cuts are part of an effort throughout the University of Maine System to eliminate 165 positions and close a structural deficit of $36 million caused by flat state funding, declining enrollment and tuition freezes. Each campus has a target amount to cut, and campus officials will submit their budgets to the system office next month. 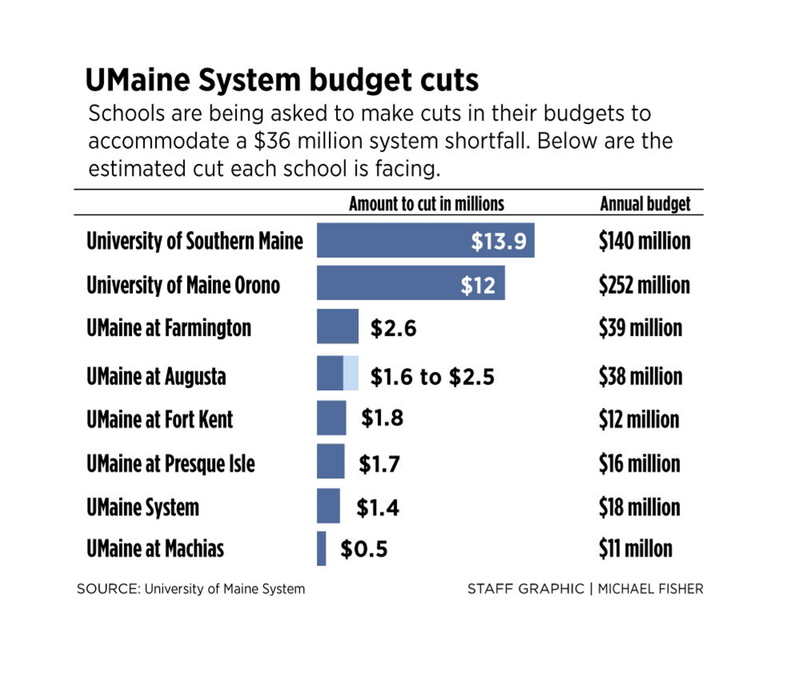 As the system’s largest campuses, USM and the University of Maine in Orono are being asked to make the biggest cuts. The campus in Orono is being asked to cut $12 million. It initially faced a $24 million structural gap, but generated an extra $11 million in tuition last fall through aggressive outreach and new student recruitment. The systemwide budget will be presented to the trustees in May. 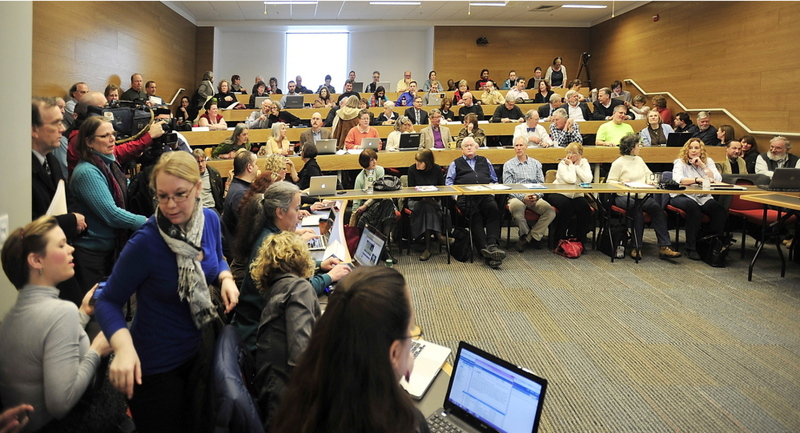 On Friday, Kalikow proposed eliminating the American and New England Studies, Geosciences and Recreation and Leisure Studies majors at the Portland and Gorham campuses, and the Arts and Humanities major at the Lewiston-Auburn College, which is part of USM. Reaction from the faculty after Kalikow’s announcement was highly critical. Geosciences professor Stephen Pollack passionately defended his department and colleagues, stabbing his finger for emphasis at Kalikow and Provost Michael Stevenson as he spoke. Geosciences student Scott Gavin, a 50-year-old former truck driver, said USM shouldn’t cut the major, which is part of the increasingly popular science, technology, engineering and math, or STEM, field. Gavin said he’s looking at a job in the energy industry, and has been accepted into a master’s program in England this fall. Several professors questioned whether the cuts would hurt the university’s reputation. Cuts based on profitability run counter to the idea of a university fostering the “life of the mind” and the creation of knowledge, said Mark Lapping, a professor at the Muskie School of Public Policy and a former USM provost. Kalikow said USM has tried smaller cuts in the past, hoping enrollment would return to pre-2006 levels, when it started to fall because of changing state demographics. Since 2007, USM has cut its workforce by 245 employees, or 20 percent. Last year alone, USM cut 83 positions, including 25 faculty and 60 staff. USM had 9,385 students enrolled at the start of the current academic year. Sociology professor Wendy Chapkis challenged Kalikow on whether there had been sufficient cuts at the top ranks of the university. “What I’ve been waiting for is information on how the administrative team is going to cut their offices to the bone in order to prevent the loss of faculty and programs,” Chapkis said. Kalikow said that since 2006, administrative positions have been reduced by 51 percent, salaried staff by 26 percent, hourly employees by 33 percent and faculty by 15 percent. 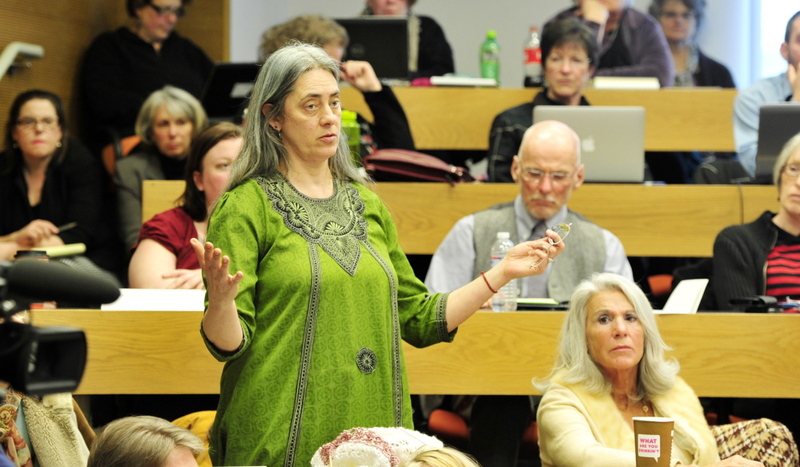 The Faculty Senate must review Kalikow’s proposal and give her feedback by May 5. • Cutting 20-30 faculty, including faculty in the shuttered programs. • Cutting 10-20 staff. USM already laid off 14 staffers earlier this year. • Moving from a 1-to-15 faculty-student ratio to a 1-to-23 ratio. • Streamlining course scheduling and instructor course loads with tenured and tenure-track faculty teaching three courses each semester, and full-time, non-tenure track faculty teaching four courses each semester. • Exploring cost-cutting options at the Lewiston-Auburn College. Exactly how much money each proposal would save was not available Friday, not even as a ballpark figure, according to Stevenson, because they have not run the numbers. The only precise figures available were an estimated savings of $2.5 million from tightening course scheduling and teaching loads, and $1 million in savings from the salary and benefits paid to eight faculty in the eliminated programs. “I was hoping to hear more numbers, not the vagueness that was presented,” Ryan Johnson, a junior majoring in Lingustics, said after the meeting. There will also be undetermined savings from about a dozen retirements, spokesman Bob Caswell said. That number may change, because the deadline to file is Monday. Kalikow said that, so far, she’s identified only about $7 million in cuts and that is “all we can envision” at this time despite the request from System Chancellor James Page that USM cut $14 million. Several professors also expressed frustration that more specific financial information wasn’t available Friday, and asked whether that meant there would be more cuts later. Kalikow said she did not anticipate further cuts next year, but provided no specifics. Page, who attended the meeting, said he planned to ask the trustees for one-time funding to close the gap at USM. “I am prepared to propose to our trustees that USM is on the right track and we need to assist them,” Page said. Provost Stevenson said low enrollment led to the proposal to cut Geosciences (25 majors last year) and American and New England Studies (40 majors.) The Arts and Humanities program at the Lewiston-Auburn College is also underenrolled, and it duplicates offerings at the Portland and Gorham campus, he said. The Recreation and Leisure Studies program is different, he said. While it had 55 majors last year, and 232 students taking courses in the program, the four-person faculty has shrunk in recent years to just one person, who has been trying to continue solo. Kalikow said they don’t plan to fill those positions, and that the program may be absorbed into another department. Any student majoring in an eliminated program will still be able to graduate with that degree, Kalikow said. Some programs with smaller student enrollment were spared for various reasons, Kalikow and Stevenson said. Classics has fewer students, but USM is the only UMaine campus to offer a classics major so it was spared, Kalikow said. Last year, the physics major was examined, but the department came up with a plan to collaborate with the Physics Department at Orono to cut costs at both campuses. Last year, USM identified 17 majors, including physics and women’s studies, that had fewer than five graduates a year, but after review recommended eliminating only five of them: the master’s programs in Classroom Teacher and School Psychology, and the bachelor degree programs in Elementary Education, Technology Education and Applied Technology Education. The trustees vote on the recommendation in July. Kalikow’s announcement follows a months-long evaluation of USM by faculty, staff and students resulting in a “Direction Package” that proposes a variety of ways to either raise revenue or cut costs. Among the proposals are mothballing old dorms on the Gorham campus; closing the John Calvin Stevens-designed Stone House in Freeport, which houses the school’s Stonecoast creative writing master’s program; reducing tuition for out-of-state students to increase enrollment, and offering more online, evening and summer courses. The entire list of recommendations is on the university’s website. The idea of closing the Stone House generated a swift backlash among program graduates, including Gorham High School teacher Dave Patterson, a 2013 graduate. Kalikow didn’t announce any facilities decisions Friday, but indicated support for closing the Stone House and Dickey-Wood Hall, the 1960s-era round dormitories in Gorham. It costs $45,000 a year to open the Stone House twice a year for a few weeks for the Stonecoast program, but the building has millions in deferred maintenance, including no disabled access, which makes it impossible to rent out to generate more income. Classics and political science double major Alex Greenlee said he understood why students and professors were upset with some of the proposed changes. Also Friday, Kalikow outlined a vision of USM as a “metropolitan university” that emphasizes the school’s connection to the Greater Portland area, from increased partnerships between the school and local businesses and agencies, to marketing the school as an urban experience that is unique in the state of Maine. As a “metropolitan university,” USM would direct students to use surrounding cities and towns “as living laboratories, thereby enriching their learning experience; the academic culture of the university; and contributing to the economic, civic and cultural life of Maine communities,” she said. That identity will also differentiate USM from the other UMaine campuses, she said. Orono has a distinct identity as the flagship campus, Farmington is a classic liberal arts college, Machias is carving out an emphasis in environmental studies. Stevenson said the Social and Behavioral Sciences program at Lewiston-Auburn College was a model of successfully integrating its academic programs with businesses and internship opportunities in the surrounding community. “They have done an astounding job, we want to replicate that,” he said. Kalikow also noted that once the changes are under way, the system will launch a search for a new president to replace her and usher in the new changes. She had just retired as president of UMaine Farmington when she agreed to take the USM job in 2012 at the request of Page, who was then the new system chancellor. Page initially asked her to serve two years, but extended it another year. Kalikow replaced Selma Botman, who was USM’s president for four years before requesting reassignment in the wake of a no-confidence vote by the faculty and controversy over big raises she gave to top administrators despite funding and program cuts.